Reviewed By Saïd Sayrafiezadeh. Two of the greatest fears of any author are obscurity and irrelevance—in that order—and there’s not much one can do about either. The former is generally in the hands of the publisher, and the latter in the hands of the reader. This is the gamble all writers take as they commence to pour heart, soul, and years into their work. “Seventeen copies sold,” Samuel Beckett wrote in Krapp’s Last Tape, “of which eleven at trade price to free circulating libraries beyond the seas,” adding acerbically, “Getting known.” Turkish author, critic, poet Ahmet Hamdi Tanpinar, who died in 1962, is overcoming the first of these writerly ailments, traversing the seas by way of an English-language translation of his 1954 novel, The Time Regulation Institute. Too strong a claim of discovery, however, may unwittingly reveal our orientalist perspective: Tanpinar, virtually unknown in the West, has long been revered in his country. 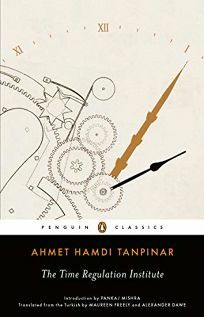 “I shall leave behind a work,” protagonist Hayri Irdal assures us early in the book, “that I believe will more or less secure me a place in the annals of history.” Time and its subsequent passage are ostensibly the great preoccupations of this novel. Irdal, put upon and impoverished for much of his life, discovers that happiness lies in his skill for repairing timepieces. We are on the precipice of allegorical territory where the reader may catch glimpses of the bewildered citizens of Franz Kafka and the cracked community of Gabriel García Márquez, and where the Time Regulation Institute itself will be built, founded with the Sisyphean goal of syncing all the clocks of Turkey, thereby ushering the nation into the modern age. But this is not really what the novel is about. In fact, it’s difficult to say what the novel is really about. Some of its confounding nature is due to the Western reader’s inability to discern, for instance, the historical significance of a character who skips Arabic and Persian words while reading. Most of the confusion, though, is Tanpinar’s responsibility; he has assembled a compendium of past events but hasn’t dramatized them. After one character commits suicide (off page), another, who happens to be a novelist, decides to incorporate this event into her book. “Wouldn’t any author have done the same?” Irdal asks. No, not if it doesn’t pertain to the story. But the story is subsumed by the “memoir” that Irdal is writing, a problematic framing device for any author, as it can allow for egregious digressions. Meanwhile, the reader waits for the narrative to begin. In An American Tragedy, Theodore Dreiser opened with a maddening 400-page preamble before arriving at the story proper—one that, 90 years later, still packs a punch. In that case, the wait was worth it. In this case, the wait is in vain. Saïd Sayrafiezadeh, the recipient of a Whiting Writers’ Award, is the author, most recently, of the story collection Brief Encounters with the Enemy and the memoir When Skateboards Will Be Free. His stories and essays have appeared in the New Yorker, the Paris Review and Granta.